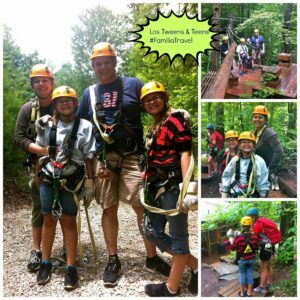 Los Tweens was invited to participate in a complimentary Zipline tour in North Carolina- all opinions are certainly our own. I used to be a bit of a nutty rider of all things fun at amusement parks and more. And then came my twins pregnancy and the ability to ride rollercoasters seems to have just vanished like many of my braincells eaten by two babies! But one thing is for sure when your kiddies start getting older, you have to have a sense of fun and little bit of adventure. If not, they IMMEDIATELY toss you into the ‘boring’ category and it only gets worse in their teen years. So this summer I decided to channel my ‘loca’ (crazy) side and try out ziplining in the North Carolina mountains right outside of the Great Smokey Mountains. Why now? The kids actually are old enough to do this with us. It was such an awesome family outing. Check out the WildWater company that we chose for our guided tour. With the fall colors in full bloom and some cooler temperatures, it is a great time to zipline and enjoy a natural setting with your family. It makes you have to trust the guides and get outside your comfort zone. Allowing yourself to tackle fears or get really outdoors is not an easy thing to do for some people – but for me it was well worth it. Is it for everyone? Maybe not and a fear of heights could be a problem. But, if you can imagine the beautiful scenary you’ll be enjoying and you’re able to enjoy this type of exercise, it’s worth it in my book. Other families have shared their fun zipline or rafting experiences with us- be sure and send us some photos so we can post to the blog as well. This entry was posted in Travel and tagged familia, nature, padres, travel, Tweens, viajes. Bookmark the permalink.